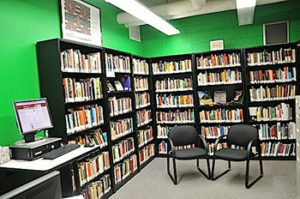 The AIS Library houses an exten­sive col­lec­tion of mate­ri­als includ­ing: Books on Native his­tory, law, and edu­ca­tion; doc­u­men­taries and fea­ture films; schol­arly jour­nals and peri­od­i­cals; lan­guage work­books and audio prac­tice; Native music; slide col­lec­tions; and pop­u­lar Native fiction. This resource is avail­able to stu­dents, fac­ulty, and staff and has a vast array of infor­ma­tion on Amer­i­can Indi­ans. Most items are avail­able for check out with a UW-Madison student/faculty iden­tity card (WisCard). The library is CLOSED dur­ing Win­ter Hol­i­days, Spring Break, and Sum­mer Ses­sions.